On a beautiful night, the East Division again came out on top in the All-Star Game. The East Division All-Stars used a four-run fourth inning to lead them to a 9-1 win over the West Division All-Stars in the 2016 PGCBL All-Star Game. With the win, the East remains undefeated in All-Star Game play. The game was scoreless until the bottom of the fourth when the East All-Stars loaded the bases with nobody out. A double play scored a run and then Ryan Hooper (Glens Falls) hit an RBI single to left field to make it 2-0 East All-Stars. After a pitching change, Robbie Knightes (Glens Falls) hit the first pitch he saw over the right field wall to extend the East lead to 4-0. Since the PGCBL started play in 2011, the East Division has won each of the five all-star games played between the two divisions. “We swung it well, we threw it well and we did what we had to do to keep the streak alive,” said Blake Nation, who managed the East Division. In a picture perfect night for baseball in Albany, a packed stadium of 1,482 fans watched the best players in the PGCBL face off. The 83-degree day started with each of the game’s participants running the 60-yard dash and taking batting practice in front of a group of 18 MLB scouts. “We had a large group of scouts. The 18 MLB teams who sent scouts had to be impressed with the prospects playing in our All-Star Game,” said PGCBL President Jeff Kunion. After the Scout Day activities concluded with extensive infield-outfield, the fans were treated to a thrilling Home Run Derby. The derby’s 12 participants put on a show under a two minute, 30 second time limit. Denney led off the final round with five points. Chris Kwitzer, as he did in the first round, put on a clinic in the final 30 seconds, totaling 12 points. Lakes finished with five points as the third hitter, giving Kwitzer the derby title. “I just wanted to pace myself and 30 seconds, that’s when it matters,” said the Buffalo product, who was the starting designated hitter for the East Division. Kwitzer said he went into the derby with the philosophy of taking every third pitch in order to not tire himself out. He practiced with Glens Falls assistant coach yesterday, he said, to get ready for the big day. 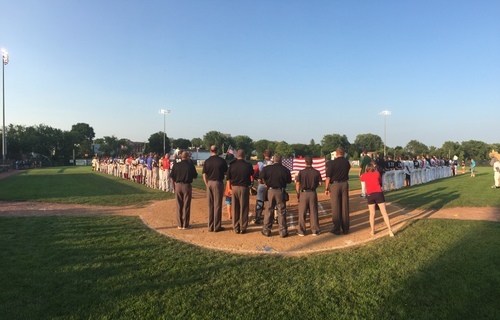 After the Home Run Derby, local children came onto the field to get autographs from the all-stars as the grounds crew got the beautiful Bob Bellizzi Field ready for action. Upon the completion of pre-game introductions and the National Anthem, it was time for baseball. The game was scoreless until the fourth when the East scored the four runs. Then in the fifth, the home team extended the lead to 7-0 on a groundout, an error and a Tanner Leenknecht (Mohawk Valley) RBI single. Sean Mazzio (Mohawk Valley) hit a two-run home run in the sixth inning to make it a 9-0 game. The West got a run back in the seventh as Taylor Olmstead (Utica) drive in his Blue Sox teammate Joe Spitaleri with an RBI triple to dead center field. Nathan Koslowski (Victor) had two hits, including a double, for the West. Joe Spitaleri (Utica) also had two hits for the West. Nick Burns (Saugerties) tossed a scoreless top of the fourth inning to earn the win for the East. Mike Hope (Utica) took the loss for the West as he allowed the first three runs in the fourth inning. Robbie Knightes (Glens Falls) went 2-for-3 with the two-run home run as he garnered game MVP honors. “It’s an honor. It’s my last summer it’s kind of nice to out with a bang, in a sense, and play well for my team and get the win. It’s a big honor because it’s such a good league and you face a lot of good pitching,” said Knightes. In the end, the 2016 PGCBL All-Star Game featured good baseball and great weather. “It was a great day at Bellizzi Field. An absolutely beautiful day, a large crowd and come exceptional baseball. It doesn’t get much better than this,” said Kunion, the PGCBL President.